Baseball goes year-round. All over the globe, Phillies players are in action and we’ve got the rundown on how they are performing. Read ahead for all the details. 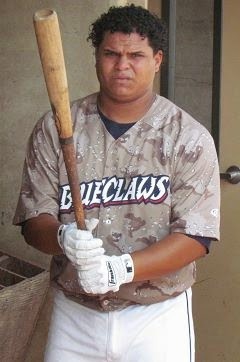 Willians Astudillo, a corner infielder and backstop who has been playing a lot of outfield of late, is batting .314 with a homer and four RBI in nine games for Anzoategui. The 23-year-old was the catalyst for the Class A Lakewood team this year, where he finished second in the South Atlantic League with a .333 average. Odubel Herrera, who was selected by the Phillies in this month’s Rule 5 draft, leads the Venezuelan Winter League in average with a .373 mark. He has also mashed five homers, driven in 25 runs and stolen seven bases in 52 games for La Guaira. The 22-year-old played second base primarily in the regular season at Double-A Frisco, but has been playing center field in the VWL. Infielder/outfielder Cesar Hernandez is batting .307 with seven doubles, 15 RBI and six stolen bases in 34 games with Lara. In 66 games with the big league Phillies this year, the 24-year-old switch-hitter batted .237 with a homer, four RBI and a steal. Catcher Gabriel Lino is batting .227 with six doubles and seven RBI for Lara. The 21-year-old righty batter, who was acquired from Baltimore in the 2012 Jim Thome trade, played in 90 combined games with Class A Lakewood and Class A Advanced Clearwater this year, posting a combined .215 average with five home runs and 34 RBI. In 16 appearances (nine starts) with Lara, lefty hurler Cesar Jimenez has a 3-5 record with a 3.83 ERA while striking out 44 and walking 12 in 44 innings of work. The 30-year-old posted a 1.69 ERA in 16 big league games with the Phillies this year. Shortstop Freddy Galvis is batting .257 with 12 doubles, a triple, a homer and 18 RBI through 49 games with Zulia. In 43 big league contests this year, the 25-year-old switch-hitter batted .176 with four home runs and 12 RBI. Elvis Araujo sports a 4-0 record with a 0.48 ERA in 15 relief outings for Zulia. He has struck out 18 and walked seven in 18 2/3 innings. The 23-year-old left-hander, who was signed as a free agent this off-season, posted a 2-1 record with 11 saves, a 3.42 ERA and a 9.00 K/9 mark in 43 combined games with Class A Advanced Carolina and Double-A Akron this year. Righty pitcher Ethan Martin appears to have wrapped up his time in Venezuela. The six-foot-two 220-pounder sported a 0-1 record with a 4.50 ERA in three outings with five strike outs and four walks over six innings for La Guaira. The 25-year-old was acquired from the Dodgers in the 2012 Shane Victorino trade. Martin appeared in two games with the Phillies this year, allowing two earned runs in four innings. In five appearances for La Guaira, righty Mike Nesseth has allowed nine earned runs in 2 1/3 innings (3.471 ERA). The 26-year-old posted a 2-7 record with a save and a 5.60 ERA in 42 combined outings at Double- Reading and Triple-A Lehigh Valley this year. The six-foot-five 210-pound Nesseth was the Phils’ 17th round pick in 2010. Infielder Andres Blanco is batting .310 with 10 doubles, two triples and 16 RBI in 32 games for Magallanes. The 30-year-old batted .277 with a homer and three RBI in 25 games with the big league club in 2014. With Aragua, righty pitcher Manny Martinez has thrown seven scoreless relief appearances. Combined with Class A short-season Williamsport and Class A Lakewood this year, Martinez, who turns 23 on New Year’s eve, posted a 1-4 record with a 5.01 ERA while striking out 34 and walking 17 in 32 1/3 innings over 26 contests. Third baseman Maikel Franco is batting .272 with seven homers and 29 RBI in 38 games with the Gigantes thus far. This year in 133 contests with Triple-A Lehigh Valley, the righty hitting Franco posted a .257 batting average with 16 home runs and 78 RBI, then made his major league debut in September, tallying a .179 average with two doubles and five RBI in 16 games. Right-handed reliever Hector Neris extended his scoreless appearance streak to open the DR season to 20 this weekend. In 18 innings for the Toros, Neris has struck out 13 and walked five. The 25-year-old appeared in one game with the Phils this year, earning a win in his big league debut and posted a 3.61 ERA in 48 minor league contests this year. With the Aguilas, righty pitcher Nefi Ogando has tossed five scoreless appearances. In 5 2/3 innings, Ogando has struck out three and walked one. Earlier this off-season in the Arizona Fall League, the 25-year-old sported a 1-0 record with three saves and a 3.07 ERA while striking out 15 and walking four in 14 2/3 innings. Right-hander Luis Garcia has allowed an unearned run while walking three and striking out three in four innings of work for the Estrellas. In 13 big league games this year, the 27-year-old posted a 6.43 ERA while striking out 12 and walking 13 in 14 innings. Infielder Angelo Mora has a .143 average with an RBI in four games for the Estrellas. In 107 games for Class A Advanced Clearwater this year, the 21-year-old sported a .227/.284/.314 slash line. Outfielder Dylan Cozens has a .260 average with eight doubles, five homers, 13 RBI and five stolen bases in 27 games with Melbourne. This year, with Class A Lakewood, the 20-year-old sported a .248 average with 16 home runs and 62 RBI in 132 games. The six-foot-six 235-pounder was the Phillies’ 2nd round draft selection in 2012. Catcher Chace Numata is batting .269 with six doubles and 11 RBI in 27 games, also with Melbourne. Numata missed much of the 2014 season after undergoing surgery to repair a broken hamate bone prior to the season. The 22-year-old was the Phillies’ 14th round draft pick in 2010. Outfielder Brian Pointer has a .200 average with a home run and six RBI in 27 games for Perth. In 123 games for Class A Advanced Clearwater this year, Pointer posted a .246 average with 15 homers, 53 RBI and 16 steals. The 22-year-old lefty batter was the Phils’ 28th round pick in 2010. Third baseman Mitch Walding is batting .239 with four doubles, two homers and 18 RBI in 23 games with Canberra. Walding sported a .237 average with seven home runs and 55 RBI in 108 games for Class A Lakewood this year. The 22-year-old was the Phillies’ 5th round draft choice in 2011. Victor Arano has a 4.76 ERA with 15 strike outs and four walks in 17 innings for Obregon. In 22 games with Class A Great Lakes this year, Arano tallied a 4-7 record with three saves and a 4.08 ERA and an 8.69 K/9 mark. The 19-year-old right-hander was acquired as the player to be named later in the Roberto Hernandez to the Dodgers trade this year. In 16 games for Mayaguez, Jesmuel Valentin is batting .333 with two doubles and four RBI. The 20-year-old infielder posted a .273/.341/.412 slash line in 120 minor league games this year. Valentin was the other player acquired from the Dodgers for Hernandez. Catcher Rene Garcia has a .271 average with three doubles, a home run and six RBI in 14 games with Carolina. The 24-year-old righty hitter was signed by the Phillies recently as a minor league free agent.